The enclosed details are primarily based upon the Reports Proceedings and also details from documents in the Naval Historical Branch, Ministry of Defence. Acknowledgment is made to the Keeper of Public Records, Public Records Office who arranged for access to the Reports held in Taunton at the Hydrographic Office. Whilst the information contained in this Summary is not intended to be completely comprehensive it sets out to be representative of the career of this ship during its deployment on hydrographic survey duties. Some place names in the Persian Gulf are not necessarily those in current use and it should be noted that during the survey work although local people were consulted, in many cases other names may be used in contemporary documents. This ship was responsible, with HMS OWEN for the whole of British survey work in the Persian Gulf area after 1950 until 1963. Service in Home waters after that date was in North Western Approaches and the Irish Sea and included participation in NATO Atlantic oceanographic programmes. Original build order on 25tgh January 1943 with Pickersgill at Sunderland for A/S Frigate LOCH GLASS changed in 1944 to AA Frigate The ship was laid down as Job Number 4795 (Yard Number 263) on 29th April 1944 and launched on 12th April 1944 as HMS LUCE BAY. After launch the contract was terminated on 6th June 1944 and she was towed to Devonport for completion by HM Dockyard as HMS LUCE BAY. Build design was changed for use as a Survey Ship during fitting out. 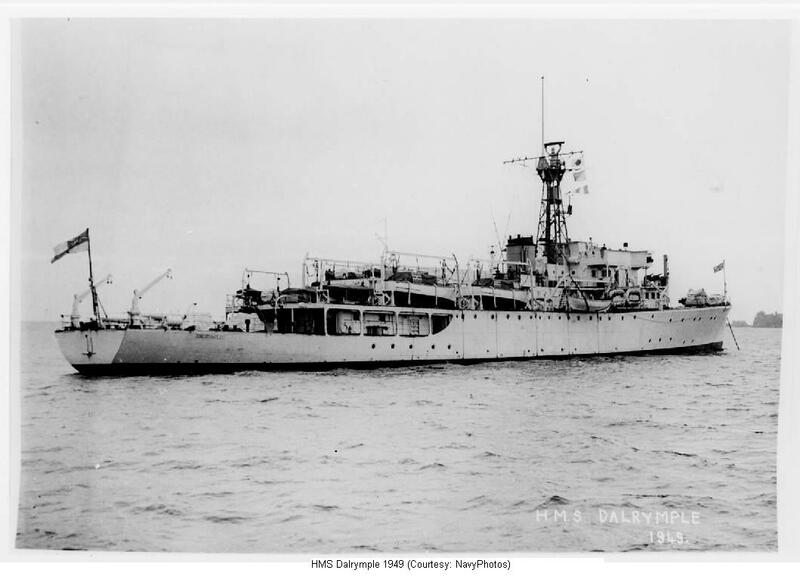 Before completion in January 1947 the name was again changed to HMS DALRYMPLE. Build was completed on 10th February 1949. In common with the other four Ex LOCH Class frigate hulls converted into survey ships the name chosen was that of a notable British hydrographer. Alexander Dalrymple (1737 - 1808). Commissioned for service on 10th February 1948. Commanding Officer: Captain A. Day, CBE, DSO (30/12/48). After repair to defects found on trials carried out shoal examinations off Spain during passage to Malta and called at Gibraltar. Detached parties landed for survey of Grand Harbour creeks using 2 survey motor boats. Ship offshore work with Beacons in Malta Channel. Taut wire measurements made. Detached party with 2 survey motor boats left behind on departure. Passage to Persian Gulf (September). Towed MFV90. Speed limited by tow and duration extended by defects in MFV. by Resident whilst MFV under repair (October). Persian Gulf (November 1949 - March 1950). Survey of Northern approaches to Bahrain. (Note: Operating difficulties with survey motor boats because of weather conditions. More use made of ship for sounding work. Discussed survey requirements with OWEN prior to joint survey work (January - February). Detached parties landed by both ships with Jeeps at Fuwairat. Completed planned tasks including coast lining. Called at Kamaran after leaving Aden. Continued survey in Adventure Bank area between Malta and Sicily. Visited Porto Hipadocle. Measured Mile off Ghain luffia survey for Fleet Navigation Officer. Local harbour survey began on arrival. 14 Days Station leave granted. Dockyard work included lengthening funnel by 12 feet to improve draught. Oh completion checked new submarine target positioned off Gibraltar to test A/S equipment. Captain visited Spanish Hydrographer at Cadiz and laboratory at Malaga. Passage to Bahrein (October - November). Bathythermograph measurements on lines of no magnetic variation in Red Sea and in Perim Strait. Persian Gulf (November 1950 to February 1951). Based at Bahrain. Survey NW of Qatar commenced with Tide Watching parties detached ,. delays by weather. Anchor damage sustained. Passage to UK (February - March). Sailed for UK to pay off on 15 February. Shoal Examinations in Red Sea and near Cape Bon. Interim Refit (April - July). Both propeller shafts replaced; Fire in Paint Shop extinguished by ships staff. A/S 162 fitted and E/S 765 replaced by E/S 767. Passage to Indian Ocean (July). Called at Gibraltar to land medical case. in Red Sea was unsuccessful. Brief stay at Aden for leave to Somali's. Zanzibar Approaches (August - November). Preparatory work proceeded without interruption as unrest in Zanzibar had subsided. Detached parties for tide watching and clearance before setting up triangulation Marks. Future work discussed with shore authorities at Mombasa. Investigated existing land survey marks. Astronomer Royal advised of queries and asked Hydrographer to make further checks. Field and boat work started. Shoal areas discovered notified to local shipping. was arranged. Excellent local assistance and hospitality provided Programme completed and shore parties recovered. Sailed for Khor Kuwai (November). Arrived Bahrain in company with LOCH GLENDHU. Shah Alum Shoal survey prior to provision of navigational light. Planned Jetty near HMS JUFAIR discussed. Detached parties and reconnaissance prior to setting up Marks and triangulation work (December). Xmas at Bahrain with Dance for Servicemen arranged by Lady Hay, wife of Political Resident. Work in Western approaches to Um Said with OWEN delayed by shamal conditions. Detached parties continued shore work. Beacons set up. R&R at Urn Said. Diverted to Basra for Manorial Service after death of King George VI. On return increased boat work and other activity to make up for earlier delays. Shamal conditions persisted until May but ship sounding not seriously affected. (Note: Jeep vehicle available for first time during this period. Soundings and magnetic checks. Called at Hallamya, Kuria Marie Islands. Extensive shoal examinations carried out in Red Sea. Mediterranean (April 1952 - June 1952). Soundings off Crete for Cambridge University. Berthed alongside International Hydrographic Bureau. Sicily Channel Taut wire measurements using Beacons and least depth checks by boats. Captain visited Spanish Hydrographic Office at Cadiz. Dockyard work delayed till August. Flag Officer Gibraltar embarked for first official visit to Cadiz by Royal Navy since 1936. Sporting exchanges and visits by Spanish hydrographers. Soundings recorded during passage from Aden. Persian Gulf Survey (December 1952 - March 1953. Xmas arrangements at Bahrain similar to 1951. At Bahrein with HMS OWEN for CinC East Indies visit in HMS CEYLON (January). Survey work additionally delayed by severe shamal conditions which caused much frustration. Investigations carried out into best methods of landing equipment over open beaches in anticipation of future requirements. At Dar-es-Salaam for Coronation ceremonies and R&R. Visited Mombasa for International Indian Ocean Exploration requirements in 1954. Embarked Governor and Lady Crawford at Seychelles for passage to Aden (June). Returned to Devonport for interim refit period until October. Daz (?) area survey by ship only as weather prevented use of boats. (December). Met OWEN to discuss progress of survey work. Detached party landed for tidal measurements at Yaz (?). Withdrawn early for medivac on 20 December. Xrnas and New Year at Bahrain. Survey resumed and completed despite interruption for two medivacs. Ship grounded on coral pinnacle - Log unit damaged (20 January). New area survey commenced (Hallul - Hadid) but delay experienced due to weather. Barge (VYC144) under tow during passage from Bahrain to Basra sank (27 February). Faisal of Iraq. 25% of survey work planned for Persian Gulf completed (April). Embarked workman for landing at Khor Kuwai. Medical emergency - evacuated by air from Salalah. East African Survey Work (April - December 1954). Preparatory work for Zanzibar harbour approaches survey (May). Assisted in search for defective underwater communications cable. Carried out Shoal examination off Hully Point. Medivac to Salisbury Island SAN Base near Durban. Hull damage during heavy weather whilst on passage to Simonstown. Docking and essential defects (June - September). Repairs needed to steering gear and machinery defects found during sea trials. (Note: Lack of lubricating oil in shaft Plummer Blocks. Southern approaches to Zanzibar survey (October 1954 - January 1955). Detached parties deployed for for coast lining and boat sounding. .Despite delays completion as planned for end December. Visit to Pemba included Bull Fight and disappointing behaviour by libertymen (December). Exercises were carried out with Royal East African Navy vessels during this period. Xmas and New Year spent at Zanzibar. Passage to Mediterranean (January 1955). Triangulation work in Malta by Royal Engineers discussed during call at Suez. Mediterranean (February - May 1955). Malta coastline and offshore areas surveyed in conjunction with RE Survey Team (See above). Fleet Exercise Areas and bays together with coastal areas by ship. Taut wire measuring gear frequently used. Fire in Galley due to Deep Fat Fryer being left switched ON. (Note: Incorrect fire-fighting procedure used. Display of Hydrographic work arranged to encourage candidates for surveying duties. Arrived at Plymouth 30 May. Port main engine re-aligned. Shaft bearings overheated during trials. Clearance parameters revised in future. Captain and officers attended launch of Zanzibar Government ship at Kingswear shipyard. No Somali ratings carried and accommodation used as Gunroom for officers under training. Mediterranean (September 1955 - Mid May 1956). Detached parties in Malta continued Grand Harbour and creeks survey. Ship Soundings and triangulation of the Exercise Areas progressed but hampered by weather. Adventure Bank and Pantelleria Strait sweeping and shoal examination (February - March). Magnetic observations using new BMZ gear. At Monaco for the wedding of Price Rainier to Grace Kelly. Premature SUBSUNK operation for HM Submarine SEA DEVIL (May). Landed party at Syracuse to return overland to Plymouth on minimum budget. Completion delay by repair work on refrigeration equipment and on post refit trials defects. Mediterranean Service (October 1956 - April 1957 including Suez Operation). During visit to Gibraltar for repair of weather damage newly dredged are of harbour swept to confirm no obstructions, (September). Grand Harbour and coastal work continued on arrival at Malta. Annual inspection by Flag Officer Malta. Diverted from planned Tobruk survey to take part in Operation MUSKETEER on 27th October. Joined Convoy MES2 and required for wreck dispersal duty.
. Stores transferred from HM Depot Ship FORTH. Arrived Port Said on 6 November. Joined other ships in task of clearance of obstructions preventing access to Canal. (Note: This was of major importance and clearly suited to a survey ship.
. Lord Hailsham (First Lord of the Admiralty) and other senior officers visited ship on 14th December. Some sniping and small arms fire took place before 22 December when all RN warships were withdrawn.
. Seven of the known 23 wrecks were removed by DALRYMPLE staff. Sailed for Cyprus two days later with Z-Lighter in tow for delivery to Famagusta. No shore leave had been possible for 11 weeks and a special R&R programne was approved by CinC Mediterranean. Visited Palermo and Naples after a 3 day return to survey of Malta Exercise areas. Coastal survey including Gozo and Exercise areas was completed and joined with military shore survey. Detached Party triangulation in Sliema was also completed. Passage to UK (March - April). Shoal examination and difficult core sampling work. Boat work carried out in dredged area of harbour at Gibraltar. due to weather conditions which delayed arrival at Plymouth. Wore UN Flag and Suez Company flag on arrival at Devonport on 8 April. (Note: 2 Range DECCA System equipment (Ex OWEN) fitted. Detached parties sent to Moll of Galloway area to find suitable sites for Slave Stations (May). On completion Slave Station calibration was effected with ship at Port Patrick, near Stranraer. West Coast Scotland Survey (July - October). Sound of Mill Least Depth sweeping over wreck (July). Carried out survey in Western Approaches to North Channel (August - November). First 2 Range DECCA Survey. Slave Stations at Port Ellen, Islay and Benbane Head, NW of Portrush, Antrim. .Poor weather caused damage to ship and at Benbane Head Slave Station. Detached party at Londonderry for Lough Foyle work. Ship sounding across North Channel in poor weather which reduced boat sounding. Outbreak of Asian 'flu reduced effort available. Local survey at Dartmouth with detached party used. South Coast Survey (February - May 1958). Wreck investigations in the Solent area. Cowes harbour and Medina River survey by detached party. Charts and hydrography exhibition at Portsmouth Navy Days (May). Extended Refit Period (June 1958 - July 1959). Replacement of Type 972 Radar by special new design Type 979 with improved ranging facility. New Bridge Plotting Room to improve facilities needed survey using 2 Range DECCA equipment. Modernised Galley to suit a cafeteria system of messing. Hull damaged by HM Destroyer DECOY during internal dockyard ship movement (August 1958). Commanding Officer: Captain G. S. Ritchie, DSC. Slave Stations set up in East Anglia and ship fixed using TELLUROMETER equipment. Passage to Persian Gulf (September - October). Annual Inspection prior to departure (August). Cambridge scientific team lead by Dr Tom Allan embarked for trials of new design towed magnetometer. Unsatisfactory Trial on Echo Sounder Type MS26J by Admiralty scientist during passage to Gibraltar (September). (Note: 16 passages made between African and Arabian shores using magnetometer and E/S equipment. Presence of Shoal in Red Sea confirmed but completion of survey delayed by radar defect. (Note: Very hot passage and arrived in Aden with Boiler defect (October). Local water boat strike aggravated need to replenish fresh water supplies. Further magnetometer measurements were obtained in Indian Ocean. Persian Gulf Surveys (October 1959 - March 1960). Slave Stations set up at Unn Said, in Qatar and on Jazirat Zarqa Island 180 miles westward. Problems also had to be surmounted before site near Unn Said was ready for use. Both stations ready for use by 13 November. Ship work interrupted by salvage of Landrover (See below) and shamal conditions. Camps set up at Gagah Island and at Raz al Hazra on mainland. Inflatable raft carrying Landrover damaged and sank during use. (Note: Vehicle retrieved with aid of divers and flotation drums. After Repair on board set back to use (November). Peninsula in relation to Iranian shore. had to join with that established in 1931 by HMS ORMONDE. Detached parties established near Ras al Khaimah for TELLUROMETER and theodolite measurements. personnel and oil company staff from Umm Said and Daz Island. approach channel to Khor Kaliya. (Note: Channel buoys were the fixed using radar and Taut Wire gear. area in fog with attendant reliance on E/S and radar. Ship resumed soundings work off Halul using existing Slave Stations. which personnel were exchanged periodically. Shamal conditions resulted in damage to anchor (27 January). on Iranian side of Gulf and to fix position of Shah Alum Shoal Light where there had been several groundings (February). Local survey completed at Umm Said by detached party (February). (Note: Surveying Recorder rating diagnosed as requiring immediate attention to deal with a ruptured appendix. successfully, to the relief of all concerned (3 March). Patient landed at Doha to convalesce in civil hospital. Investigations made by Work Study Team relating to use of new maintenance system (January). Passage to Passage to UK (March - May). Soundings made on Murray Ridge in Indian Ocean and refuelled at Karachi (March). Shoal examination in Brothers Light area in Red Sea (March). Shoal examination off Cape Eon using Beacons and assisted by four Coastal Minesweepers. (April). Called at Tunis and embarked Admiralty underwater scientist for oceanographic work (April). Experienced very adverse sea conditions in this 3 day task. Arrived Plymouth for refit 12 May 1960. Refit Period (May - September). Damaged by catamaran after being struck by HM Destroyer DECOY during dockyard movement. Consequential structural repair carried out by dockyard. Sailed from Plymouth on 13th September. Mediterranean transit coincided with NATO exercise (September). by jackstay transfer during passage to Bahrein (October). Persian Gulf ( October 1960 - March 1961). Diverted to assist with fire-fighting on ss POLYANA abandoned 95 miles east of Bahrain. (Note: This major salvage operation lasted over 7 days. Inadequate stock of Foam available caused delays. Derelict ship was towed back to Bahrain. Substantial Salvage awards were paid..
Ship sounding began in Balul area on completion of salvage work. Operation LINK H (November). An Iranian Navy Liaison Officer embarked at Bandar Abbas. Linking measurements completed by 26 November. Checks made on accuracy of new commercial DECCA Chain for use by merchant shipping (November). Strait of Hormuz. Slave stations retained at earlier sites. Boat Soundings made in Khor whilst ship dealt with open waters. Christmas was spent at Unn Said. associated with local RN survey. Tidal gauge was set up at Sharjah (One rating accommodated at RAF station). Proposed site for automatic tide gauge at Masirah area on Qnani coast was surveyed. instead of Hormuz Strait shipping lane (February). Recovered Slave Stations equipment and arrived at Aden on 20 March. Oceanographic measurements at 6 Stations and Shoal examinations in Red Sea (March). Planned survey work in Cyprus area cancelled. Diverted for 2 Range DECCA survey on Adventure Bank and Pantelliria Bank based at Malta. Called at Marsala to land equipment. Local survey in Malta in Msida Creek entrance by detached party (April). Collected Slave equipment at Marsala on completion. Hydrographer of the Navy visited ship Navy before start of refit. Refit Period (June - September 1962. Quarterdeck corrosion below wooden surface treated. Boat Davits replaced by new VIDAL-type. Bridge Plotting Office enlarged and air conditioning unit fitted. Completion delayed by late delivery of winch controllers and extensive A&A work. New design Proton Magnetometer using towed sensor and on board Recorder Unit provided. Three scientists from London University embarked for magnetic observation work. Msida survey work continued whilst at Malta. Automatic tide gauge set up at Masirah and Survey work in conjunction with BP Company craft. .Murray Ridge investigations in Indian Ocean with Magnetometer. Persian Gulf (October 1961 - February 1962). Detached Party landed at Bahranni Island off Trucial coast for tidal measurement. Survey carried out on Trucial Coast between Sir Abu Nu'air to Abu Dhabi (November 1961 - January 1962). Detached parties landed for triangulation and measurements ashore. Sea demonstration for Ruler of Abu Dhabi. Completed survey of approaches to Sitra on Bahrain Island. Telemotor Steering unserviceable for several days. Boiler Feed pump and Engine Throttle Valve defects. Use of hand lead sounding when Boats E/S Recorder Unit defective. Diverted for medical emergency work at Doha. Modified Tide Gauge at Masirah which had become submerged in sand. Checks also made on Commercial DECCA Chain operation. Annual Inspection by Commodore, Cyprus. Continuation of North Coast Survey. Ship and boat sounding off Cape Andreas and from Exarchos Bay to Nbra Psaria. (Note: R&R periods at Famagusta, Kyrenia and at Salamis, Greece). Intact but cracked amphora recovered by shallow water diver at Salamis. Increase in alcohol-related offences compared with the number when in Persian Gulf area. (Note: Extensive hospitality by Israeli Navy. Shore excursions provided to Jerusalem, Nazareth, Sea of Galilee and Acre. Sporting exchanges and reciprocal social events. Met OWEN for period of joint exercises in Mediterranean. Families joined ship for machinery pre-refit trial on June 1st. Refit Period (June - September 1962). Financial limits on Dockyard work. (Note: Only mandatory A&A, repair to survey equipment and boats. Hydrographer of the Navy visited ship and transferred to HMS OWEN (September). Passage to Persian Gulf (September -October). Two scientists embarked magnetometer work, rock samples and water sampling at various depths. Tide Gauge party landed at Aden for air passage to Masirah. Excellent readings were obtained by the magnetometer which sustain sane damage by collision with a shark (October). Persian Gulf (November 1962 - March 1963). Coast-lining party landed at Sir Abu N'air and extensive ship sounding. Some interruption by Shamal conditions. Measurements were made by TELLUROMETER and astronomical fixes taken. On return passage participated in Indian Ocean International Exploration work..
Investigated characteristics and extent of Murray Ridge. Note: It was found to be SW extremity of a chain of underwater mountains extending from Continental Shelf off Karachi. Sampling work and magnetometer records made. Bottom sampling and an investigation of wrecks by shallow water divers North of Qatar. Kuwait Approaches survey progressed (January - February 1963). Diverted from programmed visit to Maldives for 14 day Guardship duty at Can. Sporting and social exchanges with the RAF Station. On release from duty ship sailed for Cyprus via Aden. Completion of Cyprus Survey (April - May). Coast-lining by detached parties and sounding by survey boats and ship in uncomfortable conditions. Shoal examination south of Limassol. End of programme covering 25 years. Passage to UK to recommission. entering homes). To be transferred to a Zoo in Plymouth. Television crews and families came on board for entry into harbour. Transfer to Sales List at end of next period under consideration. NW Approaches (September 1963 - December). Survey and oceanographic work in poor weather. Core samples and magnetometer measurements in Rockall sea area. Detached parties in Ulster at Lisahally for coastal work. Minor collision at Greenock with RFA ROWANOL without serious damage. Docking and Essential Defect Repair (November 1963 to January 1964). NW Approaches Continuation (January - June 1964). Hydrographer visited ship before departure. Fisheries Inspectors and scientists embarked for series of scientific studies at oceanographic stations between Instrahull and Rockall. Sampling and water temperature measurement work hampered by weather Force 10 winds). (Note: Two Inflatable rafts lost in severe weather conditions. Partial flooding and damage to Dome mechanism in A/S Compartment (March). Detached Parties sent to set up Slave Stations and for coastlining and TELLUROMETER work in Ulster (April). On completion of repair continued ship sounding. (Note: Weekends in Liverpool (May). Confirmed position of Rockall. Sonar sweeping. Investigations at Stations between Malin Head and Rockall. Sonar search made for obstructions during return passage. Completed survey off Ulster coast (June). Visited Belfast and carried out sounding in Belfast Lough on departure. DECCA Slave Stations dismantled and transferred to Islay and Tiree. Detached parties landed at Moville for local survey of Lough Foyle, western shore. Ulster Coast Survey Continuation Work (April - June 1965). Coastal survey with ships boats off Down Coast completed (May). Delayed by repair of machinery defects in Londonderry. Completed with water sampling and bathythermograph measurements. Fisheries Laboratory representative on board. Repeat of 1964 Programme in four Phases. (Note: A Mail drop including heavy mechanical spares caused damage to another parcel containing clothing. Weather conditions deteriorated towards end of the period and swell made measurements barely acceptable. Diverted to assist ss MANCHESTER MERCHANT. Seaman landed at Buncrana for hospital treatment. Detached party with two boats was employed in a local survey of Lough Swilly in the Irish Republic. HMS VIDAL wore flag of the Hydrographer and five other survey ships took part. Examination of St. George's Channel profile (As 1965). Position and least depth of Wreck in Cardigan Bay established. Detached party returned to Lough Swilly area to continue wreck identification. Additional party sent to Sligo. Slave Station transferred from Tiree to Malin Head area in Irish Republic to assist with sounding work. (Note: Some interference with signals experienced from commercial radio station in Germany. Royal Norwegian Navy seamen lost overboard from KNM BERGEN north of Instrahull. On completion recovered Sligo detached party. Ship soundings made at Sligo..
Hydrographer of the Navy embarked for entry into Plymouth on 28 November 1965. Escorted by MERMAID and MEDUSA for final return after 17 years surveying service. Reduced to Reserve on 2 February 1966 and placed on Disposal List. HMS DALRYMPLE was sold to Portugal and renamed NRP AFONSO DE ALBUQUERQUE in March 1966) This sale may be in part due to the significant degree of co-operation and liaison between the two Hydrographic Services. Portugal had also purchased two other BA Class AA Frigates whose basic machinery was identical. She continued to be used as a Survey Ship. She was used to carry out hydrographic work on the Portuguese Continental Shelf, off the Azores and the Madeira Islands. After being de-commissioned on 14 January 1983 the ship was used to accommodate ships companies during refits in the Portuguese Naval Dockyard at Lisbon. In 1988 the Portuguese Naval Attache in London confirmed she was still used in this role and so must have then have been the last LOCH Class hull still afloat.